30 Days to a Better World starting with Me! This book of 120 images offers an added benefit by pairing beautiful nine-pointed-star-motif mandalas with the names of spiritual virtues. Meditating on the virtue while getting lost in the art of coloring can create a kind of simple prayer that draws us closer to our Divine potential. Kindness is the magnet of the human heart. Thank You 2 1/4" round button has a safety clutch pin so you won't poke yourself while you are wearing it. Kindness is the magnet of the human heart. 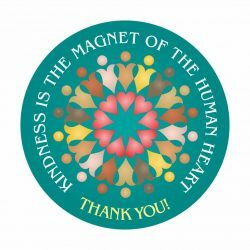 Thank You These magnets are 2 1/4" diameter. Seize your chance to show Kindness button The Seize kindness button is 2 1/4" diameter. The Brilliant Star wallet card features a beautiful star shaped outline with children from many cultures. On it is this prayer written by Abdul-Baha O God, guide me, protect me, make of me a shining lamp and a brilliant star. Thou art the Mighty and the Powerful. They are blank on the back. Virtue Star Stickers are three sheets of 24 1.6-inch stickers give you 72 colorful stars proclaiming 52 different child-oriented virtues listed in alphabetical order. 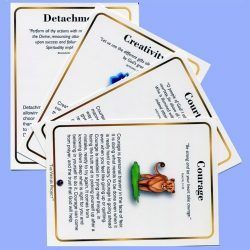 Both a teaching card and a personal reference, the ways to praise card to help you and your friends find just the right words to use to encourage the development of virtues at home, at school and in the work place. The front lists 46 positive qualities under the six character strengths developed by the Positive Psychology movement. Their research suggests that developing these strengths will help people become happier and healthier, and I couldn’t agree more. It is an example of science and religion agreeing on the same principles for different reasons. The back explains the importance of making praise specific and offers sample phrases that you can practice using to make your words of encouragement more effective. Kids will love showing off how tall they’ve grown, and parents will appreciate the free chart and the emphasis on character. The title of this colorful Virtues Alphabet poster is Character Building from A to Z. It is based on our popular Virtues Alphabet Refrigerator Magnets. It will help you teach your children virtues and character strengths right along with their ABCs.